Fellmoor is a village off Pinnacle road, southeast of The Fringe (quest-related). 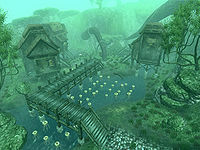 There are four residents and three houses when first discovered, as well as quite a bit of Water Root Pods, the sole crop of the settlement. Quite serious about the Root Pod farming, each for their own reasons, the two Khajiit seem to play slave to the Altmer Cindanwe. She persistently follows them and orders them around to ensure they are working. How long this will last, only time can tell, as this is the subject of the quest that starts here. 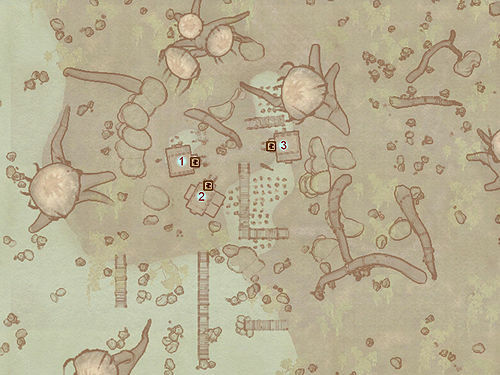 Water Root Pod Pits have Restore Health as their first alchemical effect, so a master of alchemy can make a good number of Restore Health potions from one trip. This page was last modified on 8 September 2018, at 15:27.